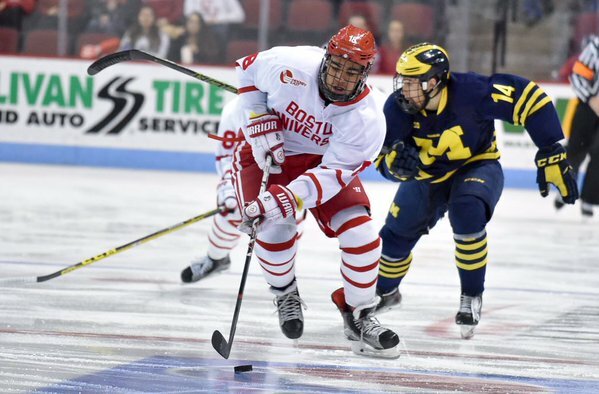 Sophomore Jordan Greenway performance at Minnesota Wild prospect camp has drawn raves from Director of Development Brad Bombardir. A second-round Wild pick in the 2015 NHL draft, the 6-5 power forward scored 26 points in a strong freshman season. Bombardir credits the job of BU coach David Quinn and his staff for the job they did in Greenway’s first year of development and said the situation for him with the Terriers is one that should continue to produce results. “David Quinn is an outstanding coach and he loves Jordan. He really feels that he’s going to be a great player for us, as do I, and as do all of us in the organization,” Bombardir said. “The style of play that BU plays is an NHL style and you can exactly see where he’s going to fit in that and where he fits there and where he fits into the system here. Greenway will join classmate Charlie McAvoy and four incoming freshmen—Kieffer Bellows, Clayton Keller, Chad Krys and Jake Oettinger at USA Hockey’s Junior National Team Evaluation Camp in Plymouth, Michigan, beginning July 30. ►Seven members of the 2016-17 Terriers participated in this past weekend’s John Cunniff Senior ChowderCup, skating for the Boston Knights Junior A team. Keller topped the team’s scorers with 12 points in three preliminary games. 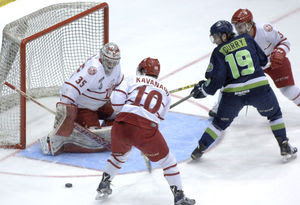 Patrick Curry (photo) had 8 points, Bellows 3. On defense, Krys had 5 (all goals), Dante Fabbro 5 and McAvoy 4. Oettinger was in goal for the Knights. Also participating in the tournament was 2017 recruit Ty Amonte who had eight points, second most for the East Coast Kings Gray. Three future Terriers are in for the USA Hockey Select 15 Development Camp. 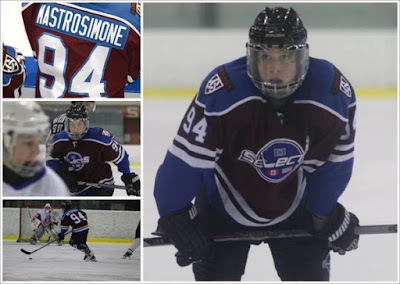 Forward Robert Mastrosimone (Team Gold), who scored 111 points for the national champion Shattuck St. Mary’s Bantams last season, was the top goal scorer (5 in 4 games) for the East Coast Selects at this past Springs’s World Selects Invitations in Philadelphia. Defenseman Case McCarthy (Team Teal), after a standout season with the Missassauga Rebels Bantam, will skate for the Buffalo Junior Sabres 16Us this season. Defenseman Braden Boyle (Team Black), a teammate of Mastrosimone last season, will skate for Lawrence Academy in 2016-17. 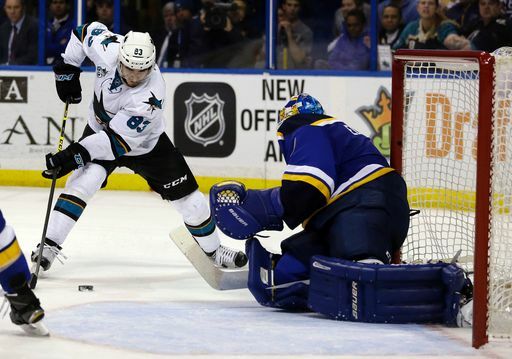 Restricted free agent Matt Nieto has been re-signed by San Jose, receiving a one contract worth $735,000. The California native, who scored 102 points in three seasons as a Terrier, had 17 points in 67 games for the Sharks last season.